Arielle at work in DAK! 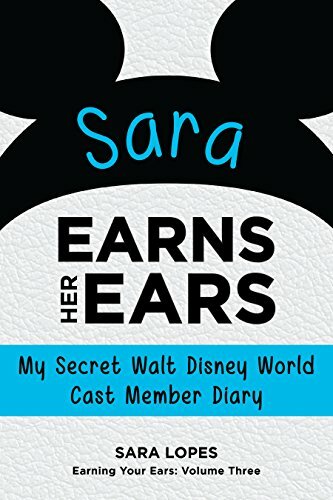 I've been sharing with you some interviews from the various roles students can have when working for the Disney College Program at either Disneyland or Walt Disney World. Recently, Arielle became interested about participating in one of these, and I quickly found out that last semester (while I was doing my program) she was doing a Professional Internship with Disney in Animal Kingdom! PI's are kind of the next big step with the Disney company. They're highly competitive and range from a variety of careers such as engineering to marketing (what I want to do!). Arielle was nice enough to tell us about her PI experience this past Spring! What role did you have during your PI, and where did you work? My role was a Conservation Education Presenter, and I worked throughout Disney's Animal Kingdom. No day was ever like the one before! A typical day would usually include standing in the Oasis at park opening with a bug box containing some type of insect (madagascar hissing cockroaches, lubber grasshoppers, Antilles pink-toad tarantulas, and huntsman spiders, just to name a few). After that, we would rotate between working at animal positions and the six Kid's Discovery Clubs. At each position, we would teach guests about the animals in the area and talk to them about conservation efforts. The Kids Discovery Clubs have now been replaced with Wilderness Explorer stations. Some days I would work in Dinoland and Africa, other days I would work in Discovery Island and Asia, and other days I was all over the park! I originally wanted a more backstage role within Animal Kingdom, but in the end I couldn't have asked for a better experience. The guest interaction and the look on the children's faces when they saw their favorite animal up close was something that I would never trade for a desk and a computer. My favorite parts were getting to hang out around animals every day and really getting to know them! My favorite was the American crocodile in Dinoland and the two anteaters in the Oasis! I learned their names, their habits, and was able to point out their favorite hiding spots to guests who couldn't see them (animals don't enjoy the hot sun either). I also loved connecting with my fellow interns. It sounds cheesy, but we really were like one big, dysfunctional family. My least favorite parts of the job was standing in the hot sun and the pouring rain some days, but even those days had its upsides, because animals love to play in the rain! I also did not enjoy when guests would lose items in an animal enclosure and I had to call for the keepers to retrieve it for them- so nerve-wracking! Sharing fun facts to guests! My favorite moment when I was working at the kid's Discovery Club in Dinoland. In that activity, kids have to put together dinosaur fossils and then name the dinosaurs. Kids always guessed the T-Rex and the Triceratops, but had trouble guessing the other two (Edmontosaurus and Camarasaurus). Most of them usually just said duck-billed and long-neck dinosaur, but one day I met a quiet little boy who knew the scientific names of all four dinosaurs! It was the first time I had seen a kid answer correctly for each, and I was beyond impressed. So I asked for his autograph. The boy was beaming from ear to ear. Afterwords, the dad quietly told me that the boy was very smart, but had a hard time making friends at school. I still have that piece of paper with the autograph on it, and I hope that boy learned that knowledge is definitely something to be proud of. What made you want to do your PI? I wanted to work at Disney because I grew up going to the parks, and I loved how no matter what I was going through at the time, all my worries just went away by being there. I wanted to make magic for others, and I wanted to make a difference in the world. If even one child took away a conservation message and decided to plant a tree, or grow up to work with animals, then I consider my time there successful. Most of the children were focused on running from ride to ride, but there were always those select few who really paid attention to what I was telling them, and it was for that reason that I continue to love and respect Disney as a magical place. Is there something you wish you would have known before doing your internship? I wish I would have known just how exhausting it would be. Animal Kingdom is the biggest park, but most people only stick to one area (such as a store or a ride). Since I worked all over the park, I was constantly running to my next location. I was also constantly sweating and chugging my water bottle every chance I got. Every day after I got home from work, I jumped in the shower and just stood there with my eyes closed. On the bright side though, I got a great night's sleep every night and by the end of the program, was definitely in good shape. I would tell others interested in this role to show enthusiasm for working with guests and animals. Even if you don't know everything about animals and biology (I certainly didn't), make sure to let recruiters know that you are passionate about Disney and inspiring others. Also, be prepared to work with a big team and be willing to work in exposure to the elements. What advice would you give to people who are interested in doing a PI? If you are interested in a professional internship, doing the DCP first is a great start! I was a rare case in that I got accepted for a PI without doing a CP, but I believe that is really rare. Most of the other interns in my group were former CP's. Definitely work hard in school and get good grades, because the interviewers do look over your transcripts. But above everything else, passion for the company and a willingness to learn new things are great traits to have while applying for any PI! If you've participated in either the DCP or a PI and would like to be a part of these interviews, just email your name and your role to thedisneyden@yahoo.com for more information!